Champions Cup: What must Edinburgh do to overcome Munster? 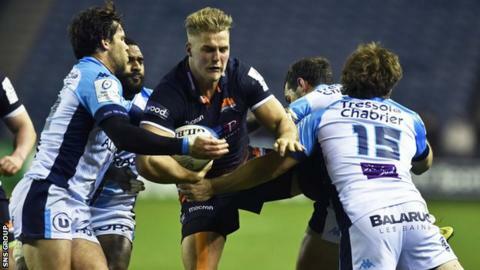 Edinburgh usurped some of European rugby's biggest names to reach the quarter-finals of the Champions Cup and will have to overcome another if they are to progress further. Two-time champions and last year's semi-finalists Munster, who knocked out Edinburgh in the Pro14 play-offs last season, visit Murrayfield on Saturday. So how do Richard Cockerill's men beat a side with a far greater European pedigree? Former Edinburgh and Scotland back-row Ally Hogg outlines what they need to do if they are to reach the last four for only the second time. Munster's defence is arguably the meanest in Europe. They conceded the fewest points and tries in the Champions Cup pool stages, an average of just 12 points per game. They're also top of the defence stats in the Pro14, again conceding the fewest tries and points. So what can Edinburgh do to breach their solid defence? It's going to be won and lost up front. The key is the forwards getting dominance to create space for wingers Darcy Graham and Duhan Van der Merwe so they can get one-on-one with defenders. Van der Merwe is out-and-out pace and size, and Graham has the ability to beat anybody within a couple of metres. Using Matt Scott and others to get those strike runners in could bring success. Complimenting Munster's iron defence is their ability to pounce on ball at the breakdowns. They rank third for turnovers won in the tournament so far and have well-known pilferers such as Peter O'Mahony and CJ Stander in their ranks. Chief among them, though, is second-row Tadgh Beirne. The Ireland international finished last season's Champions Cup campaign with 18 turnovers won - more than anyone else - as he helped Scarlets reach the last four. He is top of the charts again this term with 13. Holding on to their own ball and gaining the upper hand at the breakdown will be vital for Edinburgh. You can get some offloads in before you hit the deck - that takes the breakdown out of the game a bit, though it's not always easy to do against a solid defence. Another option is to play a bit tighter, to make sure you get support to the breakdown. I imagine Edinburgh are working on being really accurate when clearing out. The last thing you want to do is send two or three more than you need to a breakdown, because then it affects your attack, and you end up being strangled. It is only the third time Edinburgh have reached the knockout stages of Europe's elite competition, and first since 2012. Indeed, this season was the first since 2013/14 that the club had even qualified for the competition. Munster, on the other hand, are two-time winners and reached the semi-finals last year. Edinburgh will need their experienced players to show leadership to compensate for a shortage of big-game nous. It's about keeping a lid on the excitement. You don't want them coming out in the first 20 minutes, throwing everything at Munster, then being absolutely knackered. It's about controlling that energy and playing sensibly and looking to your more senior guys like Henry Pyrgos, Grant Gilchrist, John Barclay and WP Nel. They've played plenty of international rugby, and you need those guys to step up and dictate what's going on, thrive on it. Munster know how to win close games. That's what Edinburgh need to learn - not to make mistakes when the game's close and the pressure's on. It'll be small margins that decide the match.